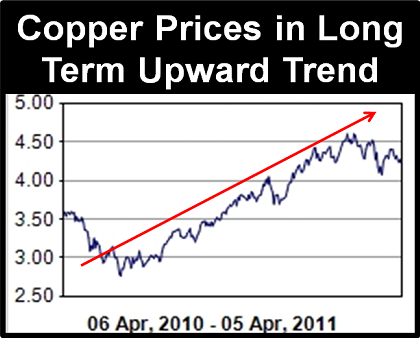 Metal analysts are forecasting a global 2011 copper deficit of 500,000-600,000 tonnes. “We are having a supply issue with this metal,” confirms Bart Melek, an analyst at TD Securities in Toronto. Most of that demand will come from China, which is in the early stages of a massive urbanization movement expected to last two decades. 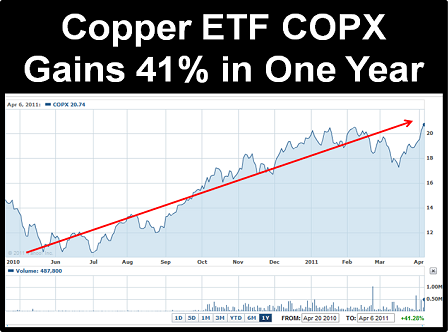 There are various ways to invest in copper, including exchange traded funds (ETFs) like COPX which have yielded solid gains in the last 12 months. But ETFs are like diesel tractors. They can get up the mountain, but not in a hurry, and they never go vertical. History has proven that investors typically realize amplified gains as an explorer ramps up to production. This is the mature exploration phase when the major drill programs have been completed, an economic resource is established, and the feasibility studies and permitting are in progress. Investor interest over this period is catalysed by bullish news-flow announcing the leasing of heavy equipment, off-take agreements, geo-surveys and preliminary construction targets. As crude oil hits $110 a barrel (up 30% in the last year) the proximity of the mine to the primary export market has become increasingly critical to the bottom line. Shipping costs from Chile to China are about $70 a tonne. Some transportation analysts forecast those costs to rise 50% in the next two years. For some South American copper projects, that may be a deal killer. Finding a pure copper play ramping up to production with a mine and smelter close to China - could be the holy grail of junior exploration investing. 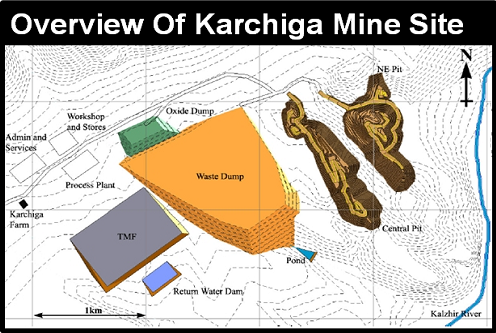 Orsu Metals (TSX: OSU) Karchiga Project in Kazakhstan is one company that meets both criteria. 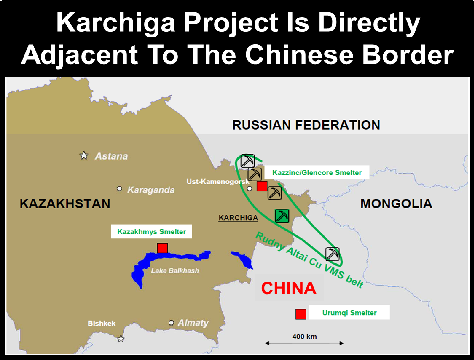 The Karchiga Cu deposit - located within the rich Rudny Altai Volcanic Massive Sulphide (VMS) belt - is only 40 km west of the Chinese border. Early 2012 – start of construction. Sergey Kurzin, the CEO of Orsu Metals is a Russian-born international mine builder and deal maker. A member of Casey’s exclusive “Explorer’s League”, Kurzin has been operating successfully in Kazakhstan for 20 years. Kurzin played a key role in establishing UrAsia Energy, a uranium producer with mining operations in Kazakhstan that sold to Uranium One in 2007 for $3.1 billion. So Kurzin has run this race, on this track before – and won. Orsu has a current market cap of $38 million and it is trading at $0.24. There seems little doubt that the Orsu stock price has been “political discounted” because of its location in “The Stans”. But according to the IFC and World Bank study, Doing Business 2010, Kazakhstan has the most improved business regulation in the entire world. Last year, it moved up 15 places and now sits comfortably in the top third. “Kazakhstan has advanced legislation,” explained Kurzin in a recent interview, “If you have a contract with the government, and if they change legislation, your document prevails”. The U.S government is also taking note of this change. 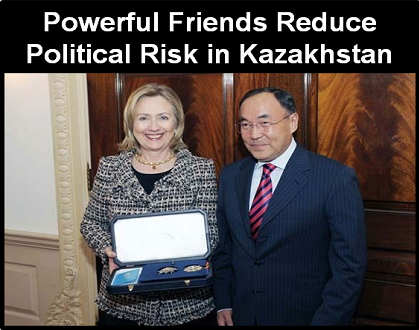 Recently Kanat Saudabayev – Kazakhstan’s senior international diplomat met with US Secretary of State Hillary Clinton to formally strengthen their political and economic ties. This upward trend was underlined by the April 3, 2011 successful democratic election of business pragmatist President Nursultan Nazarbayev. 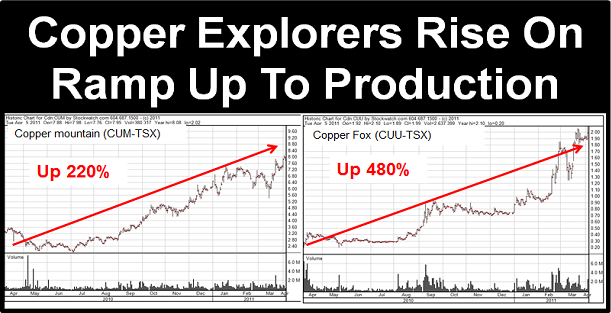 For a junior explorer, the ramp up to mine construction is typically one of accelerated shareholder gains. Buoyed by a global copper deficit, surging spot prices, proximity to China and improving business climate, Orsu should warrant a closer look. More at OrsuMetals.com . Investors Guru Small Cap Stock Observer publishes interesting contributor articles in addition to its own content. We have not verified any of the above details.